Draw Weight for my Bow, What’s Best for me? Pulling back on a bow and holding the draw to aim your shot takes strength, just how much strength is determined by the draw weight of the bow. The weight you choose will depend on your experience level and general physicality. You also need to consider what you want to use the bow for. Are you a hunter or target archer? When you’re shopping for a recurve or a compound bow you’ll find that draw weight is listed in pounds (lbs). Our table below shows you different categories of people, children, youths, men and women and a corresponding (average) weight category and from that a suggested draw weight. 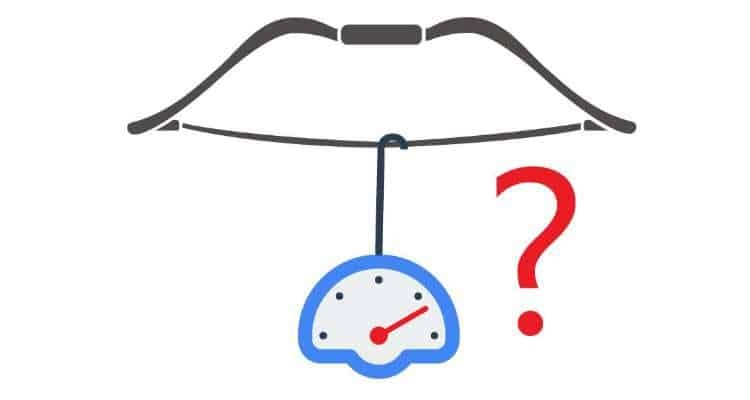 Firstly, lookup what type of person you are and from that you should find you fit into the corresponding weight category and be able to lookup your suggested draw weight. If you are either over or under weight and don’t fit into a particular category exactly, I’d suggest that you go primarily with your size/strength in the type/build column. If you’re a beginner you’ll find the best route is to lean towards a lighter draw weight. The reason for this is that you need to develop good technique first. Once you have good consistent technique then you can think about increasing weight. As you become a more experienced archer your strength will develop naturally and you’ll be able to draw and hold steady with more weight. You’ll then find you need to either move up the suggested draw weight range, and maybe even creep into the next category. ​You’ll find the draw weight on a bow usually marked on the face (the side of the limb that faces you) of the lower limb. Normally it is specified in lbs at a given ideal draw length, i.e. 30 lbs @ 28 inches. That would mean that when drawn to 28 inches the weight on the string would be 30 lbs. Over or under drawing the bow would increase or decrease that weight. By how much you ask? That really depends on the bow, however a good rule of thumb is that for each inch over drawn you could expect an extra 2 lbs of weight. For each inch under drawn you’d expect to lose 2 lbs from the draw weight. You might assume that a heavier draw weight will lead to a more accurate shot due to the arrow flying faster and flatter through the air to your target. You’d be wrong. A higher draw weight requires a stiffer arrow, and a stiffer arrow is generally heavier. A heavier arrow will fly more slowly and offset some of the gains from the increase in draw weight. Arrows get stiffer and lighter as technology improves, but the general principle still holds and gives a different arrow requirement for target and field archers vs hunters. You can shoot 70m targets (olympic distance) with anything from a 25lb draw weight upto the maximum available but if you want to go hunting you’d need ideally to start with something like a 40lbs draw weight as anything less won’t be a lethal shot. Male Olympic recurve archers can draw anywhere from 45-55 lbs and females 40-50 lbs, so they’re up there in the highest brackets, but these people train daily with their bows to increase their strength. Using a bow as a weapon to hunt requires a heavier draw, and a heavier arrow. The heavier the arrow the more force it will impact with, the further it will penetrate, and the more damage it will do. A target archer has different considerations in this respect. A heavier draw will be harder to hold and aim steadily, consistently and accurately with. We’d recommend a miniumum draw weight of 40 lbs for a hunter. Sure a heavier arrow may produce more kinetic energy and penetrate further even with a lower draw weight from a shorter distance. However many states make laws specifically restricting hunters to using bows and compounds with a draw weight no less than 40 lbs. Check your state regulations before you purchase. Compound bows have a different draw weight scale altogether, due to something called ‘let-off’ a compound bow archer has to hold far less poundage at full draw than a recurve archer, and when releasing the string the bow does the work to compound the energy stored in the limbs and give a more powerful shot. A compound bow will normally have a let-off percentage in the specifications allowing you to calculate how much of the actual draw weight needs to be held at full draw. A compound bow with a 50 lbs draw weight and a 70% let off would require you to draw 50 lbs part way through, yet only require​ 15 lbs of force to be held when at full draw. 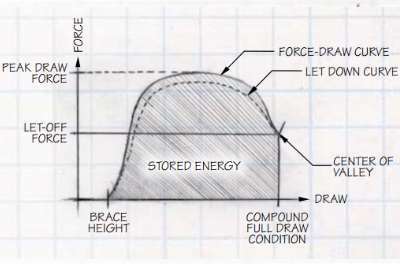 Checkout these force and draw curves from the ATA specifications, you’ll see the difference. The further you draw a recurve the higher the force, whereas a compound bow reaches peak force part way through the draw (force draw curve) and a full draw you only hold about half of the total force that will be applied after you let go (the let down curve).